If you have an upcoming event that requires food catering on a large scale, then you know how difficult it can be to find the best catering services in Michigan. Not only can catering services be incredibly costly, but they also may not offer a broad enough selection of food to satisfy your guests. However, at Restaurant Connection, we frequently cater large event ranging upwards of 500 individuals. 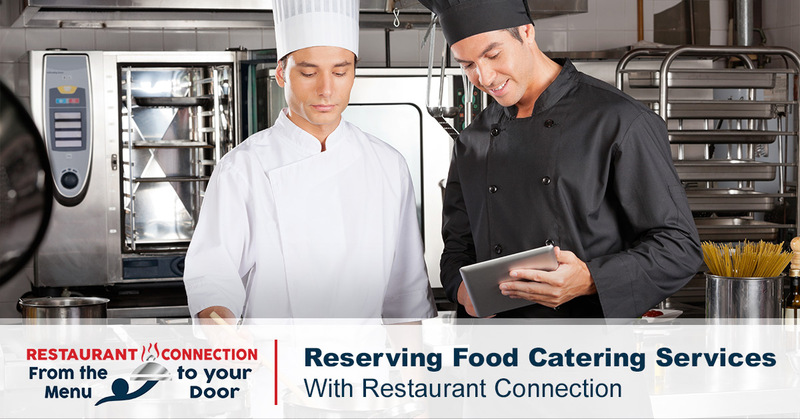 In today’s article, we will be taking a closer look at just how easy it is to reserve your next catered event with Restaurant Connection; Michigan’s best online food delivery service. Whether you are looking for a late-night meal or you simply have to stay late at work, you may find yourself craving food delivery to make your life easier. Why inconvenience yourself with long wait times, overcrowded restaurants, and timely commuting? Instead, place your online food delivery order with Restaurant Connection today. We have hundreds of restaurants for individuals to choose from, and we work hard to ensure that you receive your order both accurately and on time. 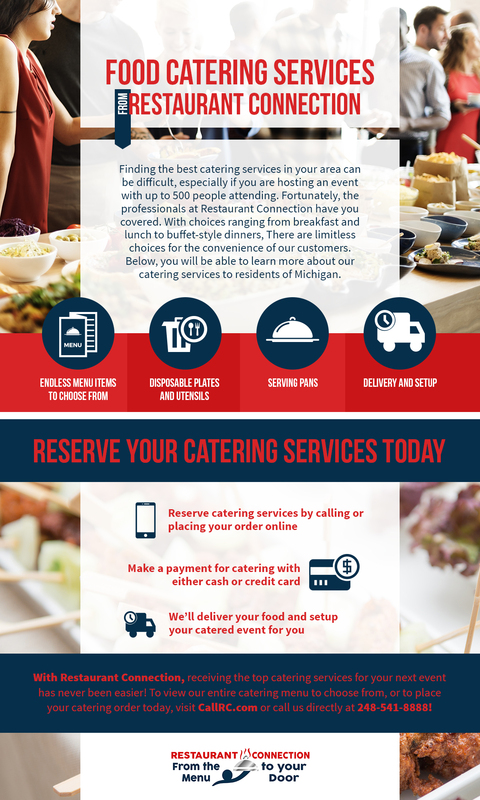 To learn how simple it is to get started with Restaurant Connection’s food catering service, continue reading more on the topic below. To begin placing your food catering order, simply call us directly at 248-541-8888 or visit CallRC.com to place an order online. We offer one of the largest selections of food available for catering online, and we even offer individual meal planning as part of our way to continue offering you, the customer, the most in both convenience and satisfaction. After you have placed your order and selected a time and date for your required catering services, we will travel to your event location and begin to setup! At Restaurant Connection, we are dedicated to maintaining a professional presentation at your event to wow guests with delicious food and beverages. We know that not everyone can pay for catering services in cash. We also know that some individuals are not able to pay for our services with credit card. Fortunately, Restaurant Connection accepts both cash and credit card as valid forms of payment so that you can spend less time worrying about the bill, and more time having fun with guests! Ordering food catering from Restaurant Connection has never been easier. However, there are a few caveats that you should be aware of while placing your order. It is important to place your order no later than 6pm the day before you require food catering for your event. Additionally, delivery charges start at $4.95 per restaurant when placing your catering order. If you have any additional questions or concerns regarding catering, or you would simply like to learn more about how our food delivery service works, don’t hesitate to reach out to our team of professionals today. We have helped countless individuals pull off flawless catered events, and we’re ready to help you too! We look forward to speaking with you!